Meet with our skilled make-up artist to discuss how you’d like to appear on your wedding day. Many congratulations on your special day. It is important to apply makeup that will last throughout the day. A trial session is highly recommended in order to achieve the desired look, thus giving you peace of mind before the big day. Before your makeup application we will discuss about your skin tone and which makeup application and products would work best for you. We use a wide variety of professional makeup products. Our favorite brands are Nars, MAC, Stila, Bobbi Brown and other. Just because the venue’s been booked and your dress has been tailored to fit you perfectly doesn’t mean that your wedding preparation is complete. The finishing touch for any bride before she can walk down the aisle is the perfect makeup. 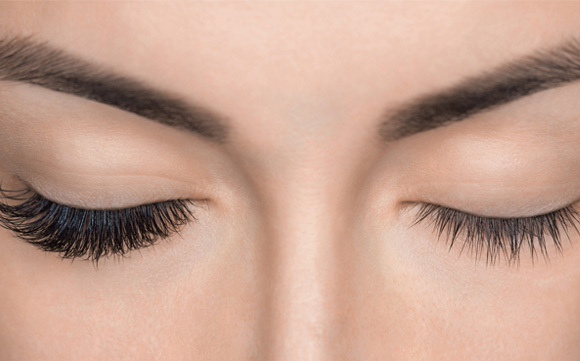 Whether you want a dramatic look or a romantic one, let us be your destination for bridal makeup in Jacksonville. You don’t want to wait until the morning of your wedding to discover what your bridal makeup is going to look like. There’s nothing wrong with a bride wanting to be in control of every detail of her special day. 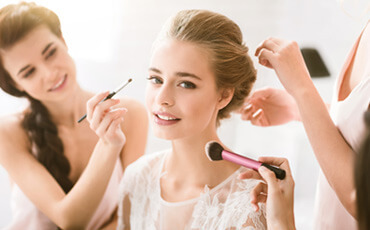 When booking a makeup artist for weddings, it’s essential that a makeup trial is scheduled long before the big event. This is why we offer all of our brides a makeup trial. Booked a few weeks before your wedding, this is a special time for you and your makeup artist to get to know one another. During your makeup trial, you and your artist will figure out what the perfect wedding makeup looks like for you. The artist will apply the makeup as if it were the morning of your wedding, allowing you to see the finished look and give it your final stamp of approval. 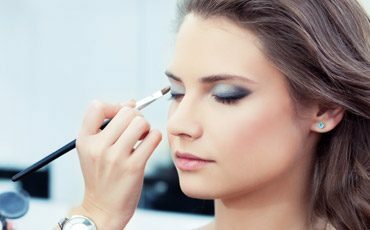 When it comes to wedding makeup in Jacksonville FL, we believe that no bride should be in the dark about what her bridal makeup is going to look like on the morning of her wedding. Most brides are a bundle of nerves on the day of their wedding. This is one of the most exciting days of any woman’s life and we want to be a part of the process. Relax and sit back as one of our talented artists uses professional products to turn you into the absolute best version of yourself. You don’t need to do anything but sip champagne as we transform you into the bride that you’ve always dreamed of becoming. Just because it’s your big day doesn’t mean that we neglect your sisters, friends and loved ones who will be standing beside you as you make the most important vow of your life. Bridal makeup in Jacksonville isn’t just about the bride, but the bridesmaids as well. We will give the special women in your life the same professional and pampering treatment that we give you. Your search for “wedding makeup Jacksonville FL” is over. We at Beauty Artistry want to help you to make your wedding day dreams come true. Please contact us today to discuss your bridal makeup goals and how we can help you bring them to life. From your trial makeup application to that very last dusting of finishing powder before you walk down the aisle, let us help you each step of the way.